How Can I Gain Humility? How Does Our Pride Kill Us? What sins can I commit and still receive Holy Communion? How Can Bad Confessions Damn Us? Will an Indulgence Take Away the Punishment for My Sins? How Can I Make a Good Confession? What is God’s Grace and How Can I Obtain It? How Can I Preach the Truth and Save Souls? How Can I Save the Soul of Someone Dying? What is Fear of the Lord? What is so Wrong with Judging? How Can I Really Love God? How Can I Desire God Alone? How Can I Regain My Faith? How can I trust in God and not become angry when things go very wrong? Why Does God Allow Temptation, Suffering and Punishment? Who Suffers the Most in Hell? Will God Punish Me and Others for My Sins? We Greatly Need His Help! to see how much we need God. Question: Can we accept God’s complete forgiving saving mercy if we aren’t sorry for any of our sins? Question: Can God’s transforming grace give us the strength to stop any sin? 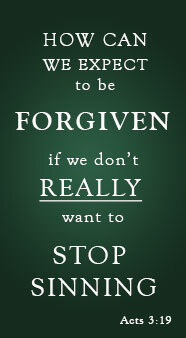 Question: If we continue to sin any sin habitually can we be truly sorry for it? Question: Can Jesus still save us if we lack true sorrow for our sins? To understand more fully please read the article below. Even though God spends our entire life loving and guiding us, trying to save us and bounds of mercy is waiting to help us, tragically, we are still dying. Most have been greatly deceived and suffer from the presumption of salvation. We simply must learn The Way! We need a SAVING FAITH. We are rejecting God’s saving merciful grace from not having true sorrow for our sins! “For the gate is narrow and the road is hard that leads to life, and there are few who find it” (Matthew 7:13-14). We can consider ourselves quite religious, who have received miracles and healings from God; we can go to Church, pray often, and do all sorts of good works; we can feel we have a great relationship with God and bounds of knowledge about the faith, and that is good, but that isn’t what saves. Did we forget the infinite offence one sin has against our infinitely perfect God? We must HUMBLE OURSELVES. God’s sanctifying grace saves (cf. Ephesians 2:8), and we reject that free gift of Eternal Life (cf. Romans 8:3) Jesus died to give us if we lack true sorrow for just one sin. Please don’t be deceived. All of those pious things we do and blessing God sends are supposed to move us into obtaining a saving faith: believing so greatly that Jesus is Lord that we will suffer or do anything to follow (obey) Him and have true sorrow for every sin if we fail–so we can accept God’s forgiveness for Eternal Life. Yet, even with all of God’s help, we still have a liking for sin and have not yet grown in our faith to hate our sins so much we would rather suffer anything than offend Our Beloved Creator. We lack much faith. But tragically most only grow in faith somewhat during our lives–not into a saving faith. Today, this is mainly because we don’t even know we need to have a saving faith/true sorrow to accept God’s sanctifying forgiving grace for salvation. The evil one has deceived us, so we don’t spend our life seeking Our Savior’s transforming grace to obtain a truly humble contrite heart. Horribly, as a result, we wind up rejecting saving mercy for sin. This true belief in Christ and true sorrow we need to be saved is so very hard to obtain, since we don’t want to leave so many sins, as we clearly see with our habitual sins. If we sought God’s transforming grace correctly, Jesus would take them away, but we have such little hatred for the sins, we continue in them day in and day out with little to no change. We are not seeking a saving faith. Are we truly following the saints, who obtained salvation, and their great wisdom and direction for us to guide us to Life? 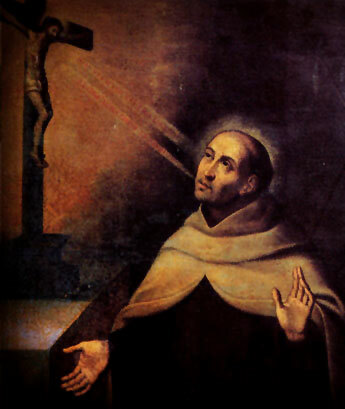 St. Anslem, Doctor of the Church tells us, “Do not follow the great majority of mankind, but follow those who enter upon the narrow way, who renounce the world [give up its pleasures], who give themselves to prayer [unceasing prayer], and who never relax their efforts by day or by night [to obtain true sorrow/saving faith and grow towards perfection], that they may attain everlasting felicity [bliss]” (The Four Last Things, Cochem, Ch. 4). Or have we been deceived, and we’re living a different way? 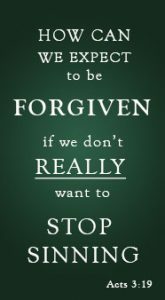 How can we obtain a saving faith and be truly sorry for any sin if we aren’t even trying to stop it? We can’t. Remember the “road is HARD that leads to Life” (Matthew 7:13-14). Are we working hard to LIVE the Word…never relaxing our efforts…like the saints? Or do we think our mild efforts are enough…or that we are living the faith, and we are saved? Please don’t be deceived. Honestly ask ourselves, “Are we perfect…a true saint?” That is what living the true faith really is. God calls us to become “perfectly holy” (1 Thessalonians 5:23 ). Yes, we “are called to be saints.” (Romans 1:7). Are we really working hard for this goal…are we striving…truly striving to obey God’s law…ALL of the law, like the saints tell us we must? Or are have we chosen a different path? Honestly, how many sins are we REALLY working to amend? One, two, any? 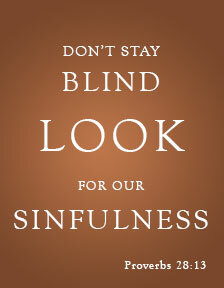 Or are we suffering so greatly from blindness that we hardly see any of our sins? Or are we someone who lies to ourselves and “says” we are working to stop all of our sins–that we are striving to become a saint–but in reality, we don’t even have real resolutions to stop. Sadly, most do the same thing every day; we are the same person today as we were yesterday? We might have changed once, but now, we are not daily growing in virtue (not growing in qualities of goodness-into the image of Christ). Oh, we might be growing in knowledge of the faith and in prayers and works, but not true holiness–becoming like Christ–removing sin striving to be “imitators of God” (Ephesians 5:1). How can we have true contrition for all of our sins if we have so little effort to amend? We can’t. Tragically, we are far from a faith that saves as our constant habitual sins and our lack of real effort to amend proves. Truly, how can we be really sorry, and accept God’s forgiving saving grace if we, who are far from perfect, aren’t even running to God daily for His transforming grace to help us change from our sinful ways? What kind of sorry do we really have?…I tell you, it isn’t true. The saints and the Mother of God have given us many warnings, but we simply aren’t listening. “I am the Lady of the Rosary, [the Mother of God exclaims] I have come to warn the FAITHFUL to amend their lives and ask for pardon for their sins. They must not offend Our Lord any more, for He is already too grievously offended by the sins of men. People must say the Rosary. Let them continue saying it every day [for my help]” (Fatima). I understand there is much confusion with the wrongful preaching and falsities being spread. Someone even created a tale, which is spreading like wild fire, that Our Lord told St. Gertruide the Great we can pray a certain prayer and a 1000 souls are freeded from purgatory, but that simply isn’t true at all. That complete exaggeration makes it seem like there are billions of souls in purgatory and its easy to be freeded. However, we can read the truth ourselves. Her writings are available on-line. We can search the pdf file (type control F on our keyboard to open a text search) and we can see there are many prayers written, but not the one we are supposed to pray. And no where does it say a 1000 or any number of souls are freeded by praying any certain prayer. But rather it says how a soul of great faith, who prays devoutly, can be of great benefit in helping to free many souls from purgatory. If we desire to help or save souls we need to become a person of great faith too. Just rattling off a prayer without true devotion doesn’t do much if anything. Sure sometimes God does show special favor to one prayer over another. But truly, how much good would any prayer be if we have little faith/charity? It is a heart of true faith that God can really use. “The fervent prayer of a righteous person is very powerful” (James 5:16). We must be careful to not be deceived. Such lies are killing us by making us lukewarm and not concerned with our eternity. Oh, we need Our Savior and every angel and saint in Heaven’s help. Mercy is waiting to teach us and help us grow in faith so we can come to truly hate our sins. But most don’t correctly seek Our Savior nor work hard to stop sinning…not ALL of our sins, because we have been deceived into believing we are saved. When in fact we are rejecting Our Savior for some wretched sin. Oh, how many sins do we ignore and don’t even think about amending. Each one is deadly. (cf. Acts 3:19). Salvation is only found in the forgiveness of our sins, since “all have sinned and are deprived of the glory of God” (Romans 3:23). And if we aren’t sorry, truly sorry, for any sin, even one, we reject Eternal Life to stay in that sin. We can’t love both God and sin. 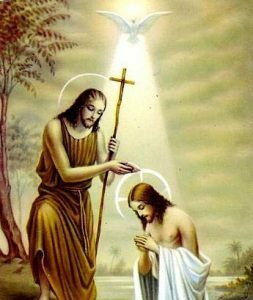 This perfect forgiveness of every sin that brought us Life was first obtained by Christ’s sacrifice at our baptism and it is kept in our souls by godly grief–true sorrow. Oh, how many think we are truly sorry, when God who reads our hearts knows we have just worldly grief or no actual sorrow at all. True sorrow is so much more than a word or thought as I will explain in this article. Oh, “how few the Elect are” as St. Jerome, Doctor of the Church, warns us in his commentary on Matthew. Even if we do grow in faith to gain true sorrow for some sins, we must know we need to grow in faith to have it for ALL of them and sadly so few do. The horrible reality is, so few have a saving faith which can accept God’s forgiving mercy because we lack a truly humble contrite heart for every sin ever committed. We have been deceived and aren’t seeking God’s grace to obtain a saving faith and reject God’s most merciful love for sin. Tragically, “those who are saved are in the minority” (St. Aquinas, Doctor of the Church, Summa Theologica I q.23, art.8)...even though God sends us so much mercy and wants us all saved. Sure, we need to, “confess our sins, [then] he who is faithful and just will forgive us our sins and cleanse us from all unrighteousness” (1 John 1:19). But this confession we must make can’t be lacking in true contrition: saying we are sorry with our words, but in our hearts we really aren’t. We need godly grief (true sorrow), and this godly grief we need, for most, takes much time to acquire. Sadly, our confessions, if we make them, for most, are simply done in word alone. Our hearts aren’t truly sorry for our great offenses committed against God, because we aren’t doing what is necessary to change. “Many, I tell you, will attempt to enter [Heaven] but will not be strong enough [for they lack a saving faith]” (Luke 13:23-24). So we can begin to see our errors in thinking, so the devil won’t own us for all eternity, please honestly ask ourselves, “Are we truly ready to suffer any affliction than to sin in the slightest way against Our Beloved Creator?” If not, we don’t have true contrition for all of our sins…self-love still abounds. What do we do to avoid sin? Anything? Sadly, most aren’t willing to suffer the slightest inconvenience or spend their time to take the smallest thought to not sin…never mind suffer the greatest affliction. “We must be ready to suffer anything rather than fall back into those sins which we have just confessed. People should be able to see a complete change in us; otherwise we have not merited absolution (not been forgiven). God who reads our hearts (cf. Luke 16:15), knows most of us simply don’t hate many of our offences against Him enough to be embarrassed, to be taken advantage of, to be ridiculed, to work hard, etc. rather than sin against Our Beloved Lord. We suffer from much self-love and aren’t continuously and correctly seeking His transforming grace, making resolutions and amending our ways. My friend, unfortunately, from not correctly seeking God’s grace, very few grow in their sorrow, from just some sorrow into gaining a true godly grief–a true hatred–for every sin. Tragically,”very few Christians are saved” as St. Augustine, Doctor of the Church, tells us in St. Leonard of Port Maurice sermon on The Little Number of the Saved. Such a great loss of life. An eternity in terrifying anguish awaits so many. We desperately need God’s mercy to give us a saving faith! Oh, many are part of the faith, but so few actually live it. To obtain a wonderful saving faith from God’s mercy that truly hates every sin (has true sorrow), we need to understand that this beautiful perfect forgiveness is only given to “everyone who believes in Him” (John 3:16). But let’s not become deceived by the evil one, who wants to own us for all eternity, and not correctly seek God’s helping, healing mercy to save us (take away our liking for sin), because we think we “believe” in Christ and are forgiven. We simply must come to know, we don’t have a saving faith–true belief–the instant we recognize Jesus as Lord. That is the beginning of faith…the infancy in faith…not proof of a saving faith. We need to “grow into salvation” (1 Peter 2:2), and for most that takes much time. Please realize, even the devils “believe” Jesus is Lord, “I [the demon] know who you are—the Holy One of God!” (Luke 4:34). Surely, we need a greater belief than the devils, who are damned. After our baptism, when we matured mentally and gained full knowledge of right from wrong and didn’t truly hate nor sincerely wish to stop our first sin, we lost (rejected) God’s magnificent gift of saving grace from lacking true sorrow for offending God–which is an abomination of love; it is a mortal sin! From the consequences of original sin, sadly we desire sin–lack contrition–very greatly. Now, after we have come to know Christ, for the rest of our life, we are supposed to seek God’s unfathomable mercy–follow Him–The Way–gain grace so to grow into a mature saving faith, that has true sorrow for every sin (true love for God) so He can save us. This is what our faith is truly supposed to be…having the goal of seeking God’s mercy (grace) so we can learn how to truly love Him and gain a saving faith so to live in Eternal Paradise. –St. Andrew Kim Taegon (His Final Exhortation Letter). Jesus only becomes Our Savior (cf. Luke 2:11) when we allow His helping mercy–His actual grace–to transform our hardened hearts of self-love, which still desires sin, into softened hearts of true love for God (cf. Ezekiel 36:26), which now truly hates all sin and all pleasures of the world (cf. 1 John 2:15) and desires God and His will alone so we can embrace God’s saving mercy He died to give us. It is true, “everyone shall be saved who calls on the name of the Lord” (Acts 2:21), but only if we call upon Him honestly wanting Him and not any sin. Therefore, we need to learn how to run to God correctly, so we can open our hearts to receive His grace and come to truly love Him by gaining a true hatred for each and every sin. Please understand, accepting the gift of eternal life isn’t hard, KEEPING IT is. Wonderfully, God “is patient with you, not wishing that any should perish but that all should come to [true] repentance.” (2 Peter 3:3). Yet the horribly reality is, “many are called [to Heaven] but few are chosen” (Matthew 22:14)…But we can be with the “few” if we repent and change and then grow in wonderful joy as we “attain the goal of faith, the salvation of your souls” (1 Peter 1:1). Because “the Word became Flesh” (John 1:14), God is the Word. They are One. Therefore, if we reject any of the Word–don’t want to obey even one command—we reject God from still having a desire for sin. This perfect observance of the Word that we must seek (cf. Matthew 5:48) can’t be done just for the sake of obeying either, thinking it is by obedience that we are saved. We are saved by faith, not obedience (cf. Galatians 3:11). We must have true faith in Christ–the Word–as the Way to Eternal Life (cf. John 14:6). As we can see, if we want to be saved, we must strive to perfectly obey the entire Word–the law of love–because we believe God is the Word and understand that by rejecting any of the Word we are rejecting God, whom we should be loving (obeying) with all of our heart. That is why we seek to perfectly obey, out of great LOVE FOR GOD. “Whoever loves me will keep my word” (John 14:23). “Whoever rejects me and does not accept my words has something to judge him: the word that I spoke, it will condemn him on the last day” (John 12:48). When we do any of the above, we don’t truly love Him. We desire sin…not God. The sad reality is, we reject God—“the Truth” (John 17:17) and His most merciful saving grace for some wretched sin in so many ways. Oh, how many sins do we desire? Not sure…well I will show you more clearly in this article so we can gain at least some awareness of our great need to change. We greatly need God’s mercy to take away our desire for sin. Now is the time to learn the Way! Eternity is forever! “There is such a thing as deadly sin” (1 John 5:16-17) and rejecting God (desiring any sin/lacking sorrow)–in any way–is one of them. It’s a mortal sin. We must have a horror for sin and only seek God’s will, not our own sinful desires (cf. 2 Thessalonians 1:5-10). If we only understood the gravity one small sin has against Perfect Goodness we would be absolutely horrified. The consequences of sin against God, others and ourselves, is incredible. If we truly comprehended this, we would run from sin like the plague it really is. produces great suffering on Earth, in Purgatory, and in Hell for eternity for us and others. Please understand when we reject God for sin, we don’t choose Purgatory either. We choose Hell. Purgatory is only for the saved who are truly sorry for their sins but still need to atone (pay the punishment/purify themselves) for their offences committed after baptism if they didn’t “cover”–atone–for their sins during their time on earth. We atone for our offences through great love: suffering for the love of God through seeking our neighbor’s salvation (cf. 1 Peter 4:8). This is necessary because we and others can’t enter into Heaven unpurified since “nothing unclean will enter it [Heaven]” (cf. Revelation 21:27). As I said before, we can’t love/desire both God and sin, we “will either hate the one and love the other” (Matthew 6:24). If we still desire–are attached–to any sin, even ONE–because of the infinite injury one sin causes God, we are guilty of denying of the whole Law (God) because we reject God’s saving mercy for some dreaded worthless sin (cf. James 2:10). But that isn’t all. If we are attached to anything at all–not even sins, but people, money, sports, things, etc.–that is idolatry! We must be attached to God. Without a doubt we must seek Our Lord to make us happy…not the world. We must “find your [our] delight in the Lord” (Psalm 37:4). “Everyone of you who does not renounce all his possessions cannot be my disciple” (Luke 14:33). But we don’t renounce our possession, we long for our neighbors things and all of the latest technology, save money to get them and buy well more than we need. We love the world and have made it our joy and entertainment. “How great is the distance between created things and God, and how souls which set their affections thereon are equally distant from Him” –St. 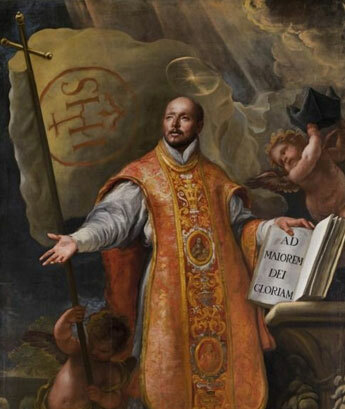 John of the Cross, Doctor of the Church (The Ascent of Mount Carmel, Ch. 5). But the devil has stripped away our horror for sin. We don’t hate it; we love it. Most, even among the faithful, don’t even know what is sinful anymore. Sadly, we don’t see where our hearts are being pulled to the world–because of our vast attachment to all of the countless things our hearts long for that isn’t God and His will. “I am afraid that, as the serpent deceived Eve by his cunning, your thoughts may be corrupted from a sincere commitment to Christ” (2 Corinthians 11:3). The evil one has us even thinking we don’t “love” sin. “Who would love/desire sin?” we say, but our lack of hatred for sin is shown in our actions–as we stay in our sins from having some liking for that evil which causes us repeat our sins over and over again. Even if we seek God’s help, most reject God’s transforming grace because our desire to amend isn’t sincere which ultimately leads us into rejecting God’s saving mercy at the hour of our death for that sin. This is because the devil has caught us. Most aren’t even concerned with salvation. We walk around believing we are saved. But, we are supposed to be spending our life seeking Christs grace to remove our liking for sin. If we are blessed to gain some fear of punishment, which is meant to move us to seek to change, some poor misguided soul, who thinks they are loving us (does’t want to see us in fear) will quickly steer us right away from God’s gift (servile fear-fear of punishment). Yet, “servile fear is a gift of the Holy Ghost” –St. Thomas Aquinas, Doctor of the Church, (Summa Theologica II q.19, art.6). Then, from their misguidance, we will go back to living our blind, concern free, lukewarm lives all over again. We are so deceived, we don’t even know what our faith really is nor possess “the gift of fear of the Lord [which] is definitely the basis [of the Holy Spirit]. It is the FEAR OF SIN.” (St. Pope John Paul II (Spiritual Diary, Sept. 23, 1976). To learn about the marvels of true fear of the Lord, and not the deceptions which have spread today, please read the article “Fear of the Lord” so we can gain true fear of the Lord and remove our desire for sin. Please don’t allow the devil to convince us that we don’t desire sin. In this article, I will show several ways, we clearly do. The evil one wants to darken us to our misery (sinfulness) and The Way to Heaven, so we lack motivation to repent and change (cf. 1 Peter 1:13-16). But we most certainly need to if we want to Live. “Repent [become truly sorry], therefore, and be converted [stop your sinful ways], that your sins may be wiped away [forgiven]” (Acts 3:19). The reason we don’t correctly run to God for His unfathomable mercy (helping grace), which is waiting for us, to bring us to a truly contrite (sorrowful) heart to save us, is from our PRIDE. “God resists the proud, but gives grace to the humble” (James 4:6). God hates our pride. (cf. Proverbs 8:13). Our pride–arrogance, vanities, jealousies, self-serving heart, stubbornness, unwillingness to see our faults–from our hard hearts, blinds us to The Way. It confuses us to what is right from wrong, obscures the truth from a lie, and blinds us to the misery of our sinfulness that lives within us. Then we lack true sorrow for for our trespasses and choose sin over God’s sanctifying grace. From this blindness, many never gain enough humility to see our true need for Jesus’s mercy (help to obtain a saving faith); then we wind up only seeing Jesus as our help for us on earth and pretty much forget all about salvation. As a result, we guide ourselves and others to our doom (cf. Luke 6:39), all the long thinking we are saved. Truly, when we have much pride, we will see evil as good and good as evil and wholeheartedly believe we are correct (cf. Isaiah 5:20) in so many aspects of our life and faith. It is a horrifying state to live in and most are clueless such a problem exists. –Jesus to St. Bridget of Sweden (Revelations, Ch. 30). Our pride causes us to have little or no wisdom (cf. Proverbs 11:2). Then we believe a lie and from that lie, we lack of true humility (don’t know our sinfulness) and consequently we never grow into having true contrition (true sorrow) for every sin. believe that from our perceived good works and faithful life of prayer and devotions, we are one of the “few” who are saved. “Every proud heart is an abomination to the Lord; be assured that none will go unpunished” (Proverbs 16:5). “The vast majority of Christians [even the faithful] are enveloped in the most shocking ignorance [of their faith]” –St. John Baptist Vianney (Sermons of the Cure of Ars, Lost Works). 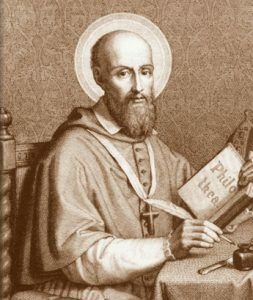 I know it is hard to believe obtaining salvation is difficult and that “scarcely anyone is saved” as St. Alphonosus says in his, Discourse to the Brethren of a Confraternity, since most of us have been deceived our whole life into thinking that mercy will save us if we just have some belief in Jesus. But that just isn’t true. The saints and the Word concur perfectly with St. Alphonosus and warn us that “the just man shall scarcely be saved.”(1 Peter 4:18-19). Why don’t we believe the Word and the saints who have far greater wisdom than we do? Truly, we don’t need just “some” belief in Christ to be saved, we need a true saving belief in Jesus: a faith so great that JESUS IS THE WAY, that we come to truly hate everything that is opposed to the Way…especially everything that is opposed to love of the Cross (suffering and sacrificing for the salvation of souls). To obtain this faith, we need a repentance that can lead to the Truth. “[I pray] God will grant them [us] repentance that leads to knowledge of the truth, and that they [we] may return to their [our] senses out of the devil’s snare, where they [we] are entrapped by him, for his will.” (2 Timothy 2:25-26). Sadly, the devil has caught us so greatly in his trap; it is as if we are looking for any excuse to justify our sins and think mercy will save us, even if we lack sorrow, so we can stay blind, not feel guilt and remain in our trespasses. We don’t have a horror for sin nor much love for God! “Make no mistake: God is not mocked, for a person will reap only what he sows” (Galatians 6:7), and if we don’t sow in tears of true repentance for all of our sins, we will reap the disaster of eternal suffering. If we truly love God and are truly sorry for our offences against God, we must HATE ALL SIN. “Let love be sincere; hate what is evil [all sin]” (Romans 12:9). I have been talking a lot about hating sin. True hatred of sin is much more than we might think. But to start understanding it we need to realize it is much more than simply feeling badly about sinning. This hatred, which is true, isn’t in word alone (cf. 1 John 3:18) either. Like I said, how can we truly love God and truly hate our sins, if we aren’t running to God wholeheartedly for guidance and strength, making resolutions and changes in our life, doing all we can to stop ALL of our sins? God deserves our love not our malice. 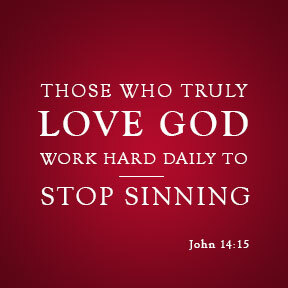 If we aren’t amending our life, to “stop sinning” (1 Corinthians 15:34), our great love for God and hatred for sin we claim to have is just a lie. God’s grace is surely enough to take away our sins, if we allow Him (cf. 2 Corinthians 12:9). The sad reality is, we don’t correctly seek God and as a result, we are not accepting His transforming grace and changing. We aren’t stopping our sins! We continue in them day in and day out thinking this is just who we are, or perhaps we feel we just can’t stop, or maybe we think our sins are just venial and nothing to be concerned about. We have a great lack of hatred for sin and prove complacency with our offences–great and small alike–against God because we don’t change…but with God’s grace (our strength), we most certainly can and must. What little love we have for God! Most of us aren’t trying to stop all of our sins; we are apparently fine with many of them. Sadly, most aren’t even trying to stop any of them. We say we are sorry for our sins, but our sorrow is far from true, starting with the fact that we put no or such little effort into changing. The reality is most don’t even know what true sorrow is–as I will explain later– so we aren’t working to obtain that goal, and we are unknowingly rejecting God’s saving mercy for bounds of sins. Lord help us! (cf. 1 Corinthians 6:9-11). The real problem for most is we have been so deceived that we intentionally cover (hide) our sins, so to stay in them without guilt…but we don’t know we are doing this. Therefore, we don’t see the vast ways we reject God for sin nor know of our great need to repent and change. We perhaps will see a couple of sins, thinking that is all we have, when we are really drowning in them. We may think we are such a loving person from our outward acts of love, but in God’s eyes we very well might be a misery drowning in pride, priding ourselves on our “good works,” craving the love of the word (idle chatter, complements, things, and all sorts of attention from family and friends) and not love from God alone. We should be running from the pleasures of the world, but we are running to them to find love and happiness and not God. Most of the time when we think we are loving another, sadly our “good deeds” are done from prideful misguided motives. We just don’t recognize the self-love and poor choices coming from our actions because our sins have blinded us. Everything we do must have the ultimate intention to guide others to the Light, as that was Jesus’ intention for all He did. Sadly, we wind up filling up ourselves and others with worldly love pulling us and others right away from God and His perfect love. We aren’t really loving one another but tragically, we are helping to kill them. We have been tricked. We don’t know the Way and think we are righteous because we have so many friends and everyone loves us, because we believe we have a great relationship with God, or perhaps we think we are saved because we have changed some parts of our lives and consider ourselves good people, but if we only honestly looked into our hearts, we would see we aren’t really trying to become SAINTS: those who don’t want to sin, who intentionally “deny himself [our will for worldly pleasure] and take up his cross daily [not complain about suffering and challenges] and follow me [truly live the Word by choosing the cross]” (Luke 9:23), just like God has commanded of us. Sadly, we are still ignoring many of God’s commands. We might agree with God’s law, but we don’t understand that we really need to obey it. We still haven’t abandoned (still desire) countless sins and pleasures and justify why that is perfectly fine. Yet, we must work to obey God and desire God alone/not be attached to—long for—any sin or anything but God (no idolatry). If we want Eternal Life we must become humble–come to know our sinfulness–our we will die. God tells us, “If you love me, you will obey my commandments [the entire Word]” (John 14:15)…we need to know where we are failing to obey so we can seek His grace to amend our ways. But since most don’t see ourselves in the correct light–even if we think we obey and love God–from the great deception that lives in us, we actually obey little from our sadly little love for God and great love for sin. Truly, this is the horrible reality for most. Tragically, most Christians aren’t growing in true faithfulness, but only growing in a facade of the faith while still justifying our sinfulness, still staying in spiritual infancy, while being deceived that we are “faithful” since we grow in prayers, works and knowledge of the faith. We still continue in our sinful habits without change. 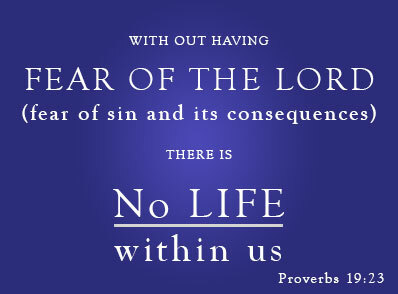 We greatly lack wisdom “fear of the Lord”–fear of sin–therefore, we never grow in true faith towards Life (cf. Proverbs 19:23). Those prayers, works and knowledge could lead to a saving faith, but it doesn’t for most because we have so much pride and are rejecting the grace they send or could send. From being deceived, we wind up only blaspheming God’s Holy Name…not truly living the Christian faith. Sadly, most don’t know the true faith, greatly lack a true horror for sin and horribly cause many injuries to God as a result. Of course God’s incredible mercy wants to save us and will save us no matter how many sins we commit, but from God’s justice, that is ONLY if we are truly sorry for each and every one of our crimes against Him. And we aren’t truly sorry for any sin, if we aren’t resolved in doing all we can to stop…that is the most basic requirement for true sorrow. Please don’t believe the lie or we will surely die. We can’t work to stop any of our sins, if we refuse to see them. How do we know if we have the true faith…the Word says to “test yourselves” (2 Corinthians 13:5). We won’t see most of our sins unless we look for them. Denial leads to doom and boy do we love to deny that we are at fault. We will come up with a thousand lies to cover our sins since our pride can’t bear being guilty. If we want to Live this must stop. We must look at our actions and see how we respond to life’s challenges (our tests) to see our errors. Everyone is good and acts well when things go as we desire, but how are we when God allows us to carry a cross? Have we passed the test or are we riddled with unrepentant/unchanging sin? It is easy to see if we are living the faith, if we want. Every time we become angry, complain, worry, impatient, frustrated, anxious, have self-pity, are in a bad mood, and suffer anything outside of peace…bingo, those are our sins. This isn’t just how we are…no, these are our sins, or at least some of them. God promises us great peace, even when we are hungry, tired and sick, when we obey and trust in Him. “You maintain peace; in peace, because of our trust in you“ (Isaiah 26:3). Believe! “Lovers of your law have much peace; for them there is no stumbling block” (Psalm 119:165). We obviously don’t love the law very much, nor trust in God’s will very well either, as our distress during suffering and challenges proves. Sadly, we still love much sin and are rejecting God’s peaceful grace as a result. The only reason we are outside of peace is because we want our will and not God’s. Truly, even when we are suffering horribly and terribly sad, we will still remain in the peace of Christ, if we trust in His will: that whatever He allows to happen will lead to great good but that is only for those who trust in Him. Sadly, we mostly want our will, therefore most of our suffering/challenges are in vain or we only gain a small fraction of the grace God truly has to offer because we have such little faith. Truly, “if you were dead to yourself [your will] you would not be so disturbed” as St. Gemma Galgani’s Guardian Angel told her (autobiography part 4). We must die to our selves–lose our self-will–have no goals in our life except filling God’s will, not just some of the time, but all of the time if we want to Live (cf. John 12:24-25 ). We can’t want our will over God’s…we must truly believe God knows the Way. All of our issues with not being able to handle suffering or problems in life, is not of God. God doesn’t want us crumble under His cross. No, HIS GRACE, when we accept it, is to makes us strong through the cross and teach us, so we can grow towards a saving faith, (cf. 2 Corinthians 12:9) not so we can run around in self-pity and despair. The cross is meant to save us! We shouldn’t become stressed or upset over anything (except sin–and even then it should be met with much patience and sorrow, not anexity). 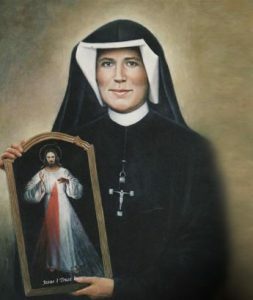 As St. Faustina said, when we trust in God, we should “fear nothing except sin” (Diary #309). True trust being great peace! Truly, His “burden [cross will become] light” (Matthew 11:28-30), when we accept His healing transforming grace. We just need to learn how to gain God’s strength and stop rejecting it. To accept God’s grace, we need humility and that comes from gaining self-knowledge of our sinfulness. How can we have true contrition if we don’t even want to see our sins? We can’t. Of course we need to read the Word and the commandments to learn what sins are, but there is so much more than that. There are sins that are easily seen and ones we need to look deeper to know. But if we love God, we will want to know them all so we can stop offending Our Lord. –St. Bernard of Clairvaux, Doctor of the Church (His Last Work). Therefore, when we notice our lack of peace during our day. We simply need to stop and look into WHY we responded in such a sinful (unloving/impatient/unpeaceful/untrusting) way and didn’t contentfully relent to God’s will knowing that is truly what is best. Please don’t blame a lack of food, medication, tired or running late, etc. for why we are irritable. It is from a lack of grace from our sins rejecting it. Sure those issues might make it harder to love, but with grace “nothing” makes us stumble. That isn’t the WHY we are looking for…that is just an excuse as to why we sinned not the real reason. The WHY we need is something like this, lets say we were very busy and had our entire day planned, then someone called and said they needed us to help them. Not wanting to be seen as a unchatarable person, we stopped what we were doing but with a complaining heart helped another. Why were we such an unloving servant? The WHY might be, “I sinned because I didn’t want to let go of my will when tested and wanted to do what I desired and not to suffer (be inconvenience). I wanted things to go the way I planned since I’m self-serving, not a true servant of Christ, who trusts in myself and not what God has allowed for me to do.” That blatant honest WHY is how we will come to know the sin under the sin and grow in humility. Our misery will be reveled in this way as we examine our conscience. Sure there is much more involved than just this in coming to know our sinfulness, but this is a beginning. Please read the article “How to Know My Sins” to learn more. After we come to see some sins, we need to look to see if we are honestly in great pursuit of God’s grace to stop these sins. Then we will see at least some of the sins we lack sorrow for, and what we need to change. We will know when we are correctly seeking God’s transforming grace, and making resolutions to amend our ways because those sins will be leaving, not staying the same. Yes, that is true, we are all just sinners but that can’t be an excuse to sin. Plus, if we justify our sins by thinking we, who are great sinners ourselves, have a right to anger and self-pity and can lack mercy towards another–rather than offer love, pity them for their lack of grace, and give them true forgiveness (not in word alone but in our actions)–we will die from having an approval of our sins. We are not sorry. There is a reason “those who find it [Heaven] are few.” (Matthew 7:14). Don’t follow the lost, but those who have a horror for sin. Follow the saints. The “few” who have accepted God’s grace, have allowed God to remove“all bitterness, fury, anger, shouting, and reviling” (Ephesians 4:31) as the Word says we must do. Honestly, have we done this…are we even trying? Are we really obeying the Word…living the true faith, or do we still habitually lack love when God tests us? Do we pass one test, but fail many others? The truth is easy to see, if we want. Please understand, without love we are nothing (cf. 1 Corinthians 13:2). Do we believe! After a life time of prayers and seeking God’s mercy, have we still rejected most of God’s transforming grace and still can’t even show love and mercy to others who correct us or who we perceive as sinning against us. Truly, “It will be easy for you to accept a harsh or disrespectful word [if you are humble]” as St. Maximilian Kolbe teaches in his spiritual writings (# 969). Where is our faith? “If anyone thinks he is religious and does not bridle his tongue but deceives his heart [that he is faithful], his religion is vain” (James 1:26). Truly, we are not yet faithful if we still can’t habitually love, under any circumstance–no matter what horrible cross we have to suffer. It is true, we have a billion excuses, filled with self-love, why we can’t obey God…please stop them and admit our guilt. Seek God’s grace, which wants to heal us of our misery and carry the crosses He allows us to bear, however long He wills, learning the Way and growing in wonderful holiness trusting in Him. I know it is hard to believe that not hating a venial–less severe–sin is going to damn our souls, especially if we have been deceived into thinking venial sins are fine to commit. But the saints in their true wisdom tell us otherwise. What Sins Can I Continue to Commit and Still Receive Holy Communion? Will Anointing of the Sick Forgive Mortal Sins? Will an Indulgence Take Away My Punishment for My Sins? Why True Penance is Needed to be Saved? Will God Punish Me or Others for My Sins? Learning how to examine our conscience, and make a good confession is key to eradicating sin, growing in humility and gaining a saving faith. How Can I Pray Humbly? How Does Our Pride Kills Us? What is Desiring to Sin? God's mercy—His love—is given to us in the form of GRACE. There are various types of grace from helping grace to saving grace. God blesses us with this grace to help move us towards perfection for the salvation of our souls. How Do I Overcome Dispair Against Hope for Salvation? Can Some of My Sins be Forgiven but Still Not Receive God's Saving Mercy? How Can I Be Happy With All of My Shortcomings? How Can I be Happy when Things go Greatly Wrong? Trusting in God means having no fear, complaint or worry with anything that God allows, knowing that, from His love for us, He allows all for our good. God allows everything to lead us to Life, no matter how painful it is and will make everything better after we suffer a little and lead us closer to the path of Life—for those who do in fact trust in Him. How Can I Over Come My Scruples? How to Desire God Alone? How Can I Truly Follow Christ? If we can obtain enough of God's grace, we can have fantastic peace during the most intense horrific suffering, but we must have the faith to surrender our will to God's. Why Should I Deny Myself of the Pleasures of the World? "Why would I choose to not be comfortable or satisfied?," the person not understanding the cross might ask. So few comprehend the cross but it is the only Way to Eternal Life. Stop Judging...Really? Are We Confused? How Can I Console Someone Grieving? Our hearts of love want to comfort others but from our mis-guided love, much of the time, we lie and claim we can read the soul of another, and tell the grieving their loved one is in Heaven. Oh, how damaging that is! We don't need to do this; we can love and comfort with the truth that brings honest hope...not a lie. How to See My Sins? How Can I Preach the Truth to Save Souls? Saving souls can be quite challenging...knowing what, when and how to speak. But with some guidance anyone can daily work to save souls like Christ and the disciples. Coming to know our sins we have darkened from our conscience is quit challenging. But there is a real effective way to examine our conscience to bring into light what lives in darkness. How Can I Really Love? What is God's Plan for Family, Friends and Salvation? How Can I Become a Real Saint? "hell shall not prevail against it"
God loves us so much, He has given us His actual Body to eat so we can unite with Him in a most intimate way. Those, who souls are properly disposed to receive His love, are blessed with such fantastic grace through this sacrament, so we can give His love to others for the salvation of our souls. “Among the penitent’s acts [the person confessing their sins] contrition [sorrow] occupies first place [since it is needed for salvation]. 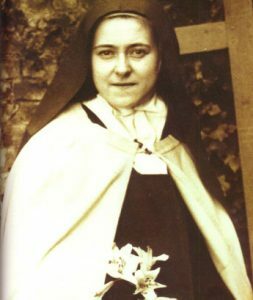 Contrition is sorrow of the soul and detestation [hate] for the sin committed, together with the resolution not to sin again [to become a saint]” (CCC #1451). “All are called to holiness [this is obedience to God and needed for eternal life]: ‘Be perfect, as your heavenly Father is perfect [must be our goal].’ In order to reach this perfection the faithful should use the strength dealt out to them by Christ’s gift [His grace], so that . . . doing the will of the Father in everything, they may wholeheartedly devote themselves to the glory of God [live for God] and to the service of their neighbor. Thus the holiness of the People of God will grow in fruitful abundance, as is clearly shown in the history of the Church through the lives of so many saints” (CCC #2013). 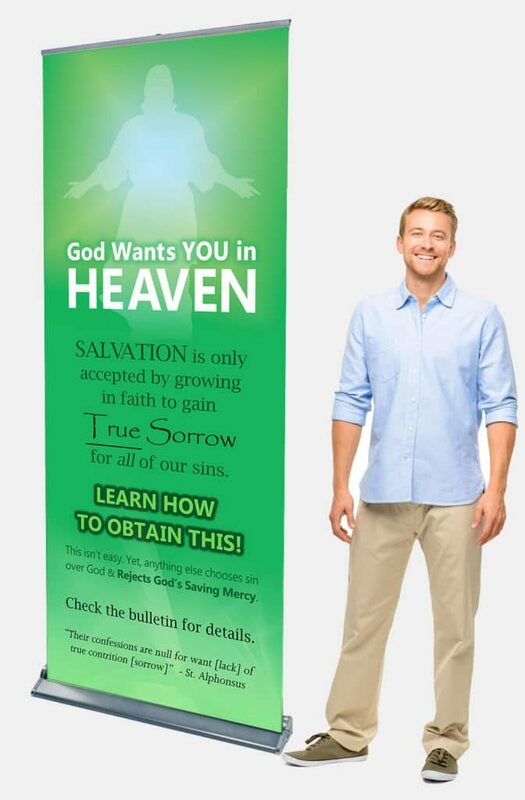 God wants you in Heaven. Hear Him crying out pleading for you to repent and change. 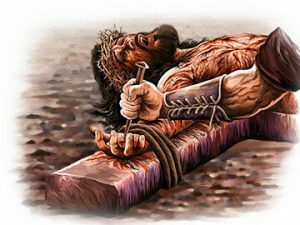 He gave you your life to live for Him. Don’t reject Him. Come embrace His loving mercy. It is waiting for you. He will take away your sins, if you only allow Him. Let go of the world and live for Jesus. Eternity is forever! Need a Prayer? Have a Question? 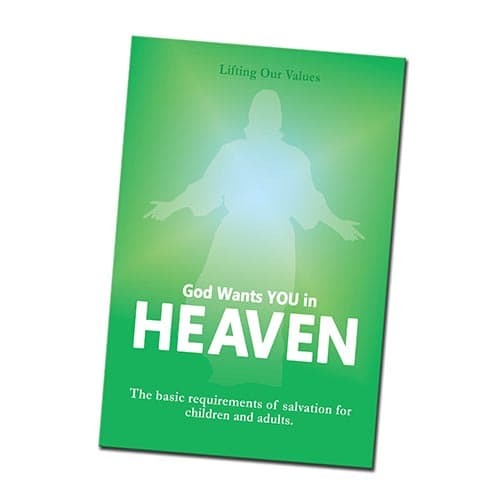 God Wants You In Heaven - Learn the Way. 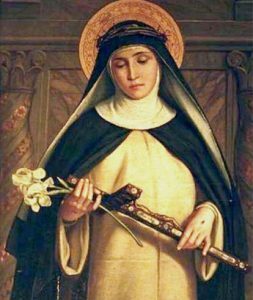 "But what is My [Jesus’] will, except that you should want to love Me above all things and not desire anything but Me" (Jesus to St. Bridget of Sweden).